Thanks to Oral-B here is your chance to Win an Oral-B Genius in Rose Gold valued at $349.00. This intelligent brushing system connects via Bluetooth to the Oral-B App, which offers up to five dental care journeys to help users achieve whiter teeth from day one. 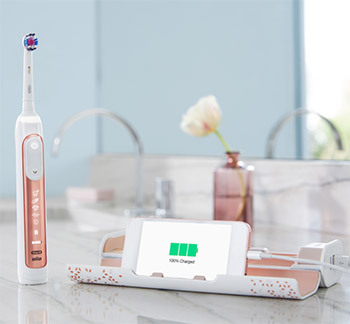 Oral-B GENIUS in Rose Gold electric toothbrush also comes with a matching charging travel case that allows you to charge your smartphone and toothbrush using only one plug and a lithium-ion battery that can last up to two weeks. You can choose up to 12 LED colors for the SmartRing to decorate your brush and suit your favorite colour or mood. Oral-B GENIUS is now available in this season's most on-trend colour, Rose Gold.